When you're experiencing a healthcare crisis, the last thing you want to do is seek out Urgent Care Beverly Hills has to offer, which is often subpar. This may be especially true if you are new to the Beverly Hills area, or if you are visiting on business or pleasure from out of town. That's why Dr. Farzam is one of the best hotel doctors available anywhere, and people who come from far and wide will ask the doctor to come to their Beverly Hills location for treatment so they don't have to leave the comfort, privacy and safety of their own hotel without braving unfamiliar or chaotic Beverly Hills traffic. Urgent Care in Beverly Hills usually means having to drive the bustling streets and then being held up in a waiting room indefinitely, where you must subject yourself to others contagious illnesses and germs. No longer do you have to worry about the healthcare clinic being a cesspool, though, because Dr. Farzam is the provider of Urgent Care Beverly Hills wants to treat their acute, chronic or traumatic ailments. Virtually any condition can be treated by Dr. Farzam and House Call Doctor Los Angeles, so don't delay in making an appointment, because Dr. Farzam often arrives on the scene in an hour or less. House calls doctors aren't a relic of the past, or a quaint idea that no long exists in the 21st century. 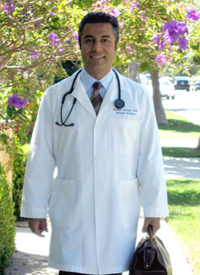 You, too, can enjoy Urgent Care Beverly Hills provides by calling Dr. Farzam today at 310-849-7991. Call anytime, day or night, for quick service!